Winter is coming to Moldova. I can feel the change in the air – even though the sun breaks through the clouds most days to shine bright and strong, it never manages to warm the air sufficiently to forget what month we’re in. While it is within October’s purview to don a breezy cloak of warmth on occasion, November is too busy kissing up to December’s gray foreboding locks; it brooks no tolerance for wistful memories of summer. I would embrace wholeheartedly this opportunity to experience – for the first time in my five decade plus life – this inevitable cycling of the seasons, the turning of life from bounty to harvest to dormancy to regeneration – all of the blessed profundity of it- if it wasn’t for the damn dogs: Canis lupus familiaris. Those ubiquitous roadies trolling behind the human bandwagon, an animal most thoroughly doomed to trace an endless feedback loop that grants it no reprieve from the vagarious impulses of a far more intelligent, yet somehow (usually) less sympathetic species. Vagabonds, they’re called here. Strains of German Sheppard, mixed with a bow-legged, furrier, terrier type: they’re everywhere in Moldova. (Though one occasionally glimpses an odd-man-out; the other day I ran across a perfect Chinese pug, shivering in the cold, reminiscent of the little prince my grandmother cherished for some 15 years.) 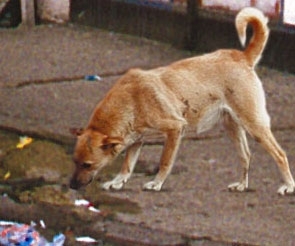 A few appear to be well-fed; I have come to realize that many Moldovans “own” dogs which they permit to roam freely about the village, opening the gate for them in the morning then granting them safe harbor when they return in the evening with the setting sun. But most are not so lucky. Fending for themselves at the outskirts of attention, they regularly ravage the few trash bins placed around town, strewing wrappers, bottles, plastic, paper, and other non-edible waste about the streets and making an already degraded environment appear even more disheveled and unkempt. You see them sitting alert in front of a child eating an apple curbside, waiting for the core that might be carelessly tossed their way; or following the kerchiefed bunica hauling a load of produce from the piața, sure that an onion skin or leaf of cabbage will stray from the bag; or trailing the busy man chatting on his cell phone while munching a placinta, lapping up the brinza crumbles falling from his mouth. They are alert, always, attuned to the environment in a way that Zoe – my dog at home – has never had need to be. I watch them wait at the edge of the highway, tail tucked between their legs, watching, knowing what’s dangerous, shying back at just the split second necessary to avoid being hit. No one (but me) it seems notices; they are invisible, skirting the edges, immensely disposable. No one pets them, feeds them, names them, buckles a collar about their bony necks. Their coats are matted, their eyes wary. As the cold deepens, setting in its claws, they coalesce into packs, finding warmth in numbers. And soon enough the guns will come; many will be shot. One is safer in the middle of the herd, by the far. Dogs are not dumb. I must keep reminding myself that their genes betray them, though: these are animals doomed to the periphery, dim notions of warmth and camaraderie suffusing their bones, with scarce few – if any – opportunities to realize them. I do not venture to connect with them; though I carry bones always, when dinner has provided them, I throw them several yards and walk quickly away, not wanting to attract the pack. 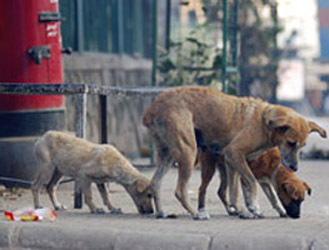 One can know a country by the way it treats its dogs…. I read your blog upon returning from the vet with my new dog, Sydney. She was there for a check-up after her hip surgery. She got the full treatment including puppy treats. The contrast is stark. I so enjoy reading your blog and hearing about your observations. Keep it up. Children and animals are a well-known excellent match. As I contemplate your post, I keep wondering about the feasibility of combining care of homeless and unparented children with the care of these dogs. Of course, money would be needed to maintain them, but it seems a shame that there are two needy populations that are known to benefit each other by their association, and to not have a way to bring these two resources together!! I strayed from the Internet for a few weeks and now and catching up on your blog – I missed keeping myself updated and very much miss my friend. So my question about the dogs…do they ever attack passer Byers? Of course I HAD to ask.